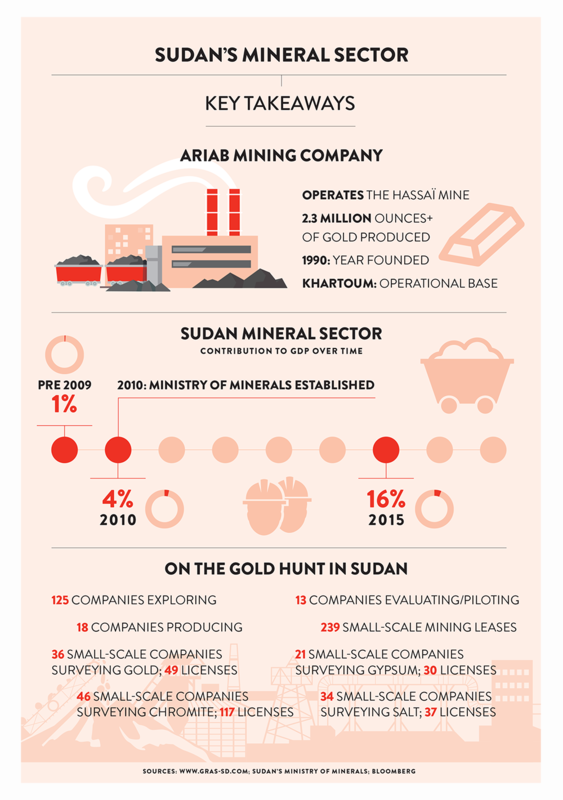 THE ARIAB MINING COMPANY (AMC), now fully owned by the Sudanese government, is taking the mining sector in Sudan to brave new heights by introducing new technologies, investments, processes, equipment and talent to create opportunities for the once oil-rich nation’s benefit. As the leading mining company in Sudan and East Africa, AMC was incorporated as a multinational private company in 1991 in Sudan to explore, exploit, mine, process, and sell gold and associated minerals. Since then, the entity has been producing gold and silver through heap leaching techniques from its concessions in the Hassai region. AMC is expected to produce 1.5 tonnes of gold by the end of the year — and the company has proven reserves of gold, copper and silver worth over $17 billion (US) at current global prices in two of its ten sites. Although Sudan has produced most of its wealth in recent years from its reserves of hydrocarbons, historically the country has also been renowned for its mineral and precious metal deposits, with Arab, Ottoman and colonial mineral explorers taking advantage of the rich seams of extractables located in the country. AMC has over 40 years’ experience in mineral research programmes in the Red Sea Hills area of Sudan, which lies in the north east of the country almost 200km from the Eritrean border, where the discovery of major mineral deposits has so far yielded more than 230 tonnes of gold, 1.3 million tonnes of copper, 0.7 million tonnes of zinc and over 3,000 tonnes of silver. AMC is not only a true player in the region but also in Africa, thanks to the numerous synergies it creates in procurement, and in leveraging its shared mining knowhow to a greater extent than smaller companies can. Its size, and its special position as a government-owned company, mean its advantages extend to marketing reach and shared infrastructure for processing, rail transport and use of port facilities. The area that encompasses and surrounds the Hassai concessions is geologically exciting, and has been recognised as one of the most sought-after areas in the world for the exploration and mining of mineral and metal deposits of all types. The past high gold production from the local silica-barite-rocks (SBR) deposits represent just the top layer of the huge volcanogenic massive sulphide deposits (VMS) that AMC wants to fully exploit, utilising expertise from around the world. AMC currently uses the conventional heap leaching process, which leaves the remaining gold within the tailing, with the goal of extracting a maximum amount of mineral for a minimum amount of harm to the environment. Specifically the company uses the carbon and bleach process to extract gold from the heap leaching tailings, and to manage the treatment and disposal of the used chemicals and minerals in accordance with the highest possible international standards, following the company’s social responsibility programme. The two main areas of operation for the company are the Duredeb and Hassai concessions. The Duredeb concession is located 250km south of Port Sudan, near the city of Derudeb at the Sudanese-Eritrean border. Multiple explorations in the area have confirmed the existence of large VMS-type deposits similar to those based in Hassai. One of the SBR/VMS deposits, named Tagoteb, has huge potential and many others have shown reserves of manganese, tungsten, zinc and copper. A recent geophysical survey on the western part of the Duredeb led to the discovery of further SBR/VMS deposits that AMC is planning to develop in 2016 – all of which is possible thanks to the company’s existing infrastructure in the area, and the mine’s proximity to Derudeb City. Easy access via asphalt road that passes the concession, and its proximity to the harbour in Derudeb City, make it a great prospect for investment in its exploration and mining. The Hassai mine site is located 450km north east of Khartoum and 350km by land from the southwest and the harbour of Port Sudan. However, it has easy access to air transport thanks to the airstrip on site. The area has been in operation since 1992, with open pits developed to extract high-grade oxide ore. 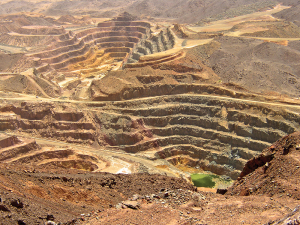 Most of the ore mined to date comes from the enriched upper zone of a much larger mineralised system. The deeper VMS deposits are the primary source of gold, and can be seen at the bottom of many of the pits already developed or in development. In September 2009 a NI 43-101 compliant resource estimate was released for the first target, at the bottom of the Hassaï South pit, and in November 2009 a second estimate followed for the target at the bottom of the Hadal Awatib pit. In 2011 and 2013 a drilling campaign focused on Hadal Awatib, Hassai and Hadayamet to obtain the indicated and measured reserves. The subsequent drilling and mining located VMS-style base metal mineralisation at ten other sites — indicating huge potential in expanding the exploration and eventual extraction. AMC is transforming itself into a multi-mineral mining company to lower its exposure to risk, and to adapt to the ever-changing needs of a growing world economy. The company is expanding its assets in several regions in Sudan, and into new revenue streams as its exploration department ramps up its search for new extractable minerals. With this reduced exposure to being a single mineral producer, AMC has managed to improve its cash flow, and lower the cost of its debt and the overall cost of its capital. And this well-judged fiscal outlook has enabled the company to aim higher and plan for large-scale projects that need the assistance of experienced global investment partners. At the 2016 Prospectors & Developers Association of Canada (PDAC) forum held in Toronto, Canada, AMC was present as part of the Sudanese delegation. AMC attracted the attention of mining experts and investors who took interest in the overall viability of the company’s projects — with the VMS deposits and general size of the concessions top of the list of discussion points. AMC is always at the forefront of seeking out the right partners to help it fulfil its role in Sudanese society as a wealth and employment generator. As one of the largest mining companies in East Africa and Sudan, AMC has long played a huge role in the lives of locals, be it from providing employment, or indeed access to clean water. The company has started the process of modernising the central village of Bir Ajjam through the construction of primary and secondary schools, a hospital for the local population, reliable water supplies, and women and youth educational and social development facilities. AMC also provides assistance to villages such as Hosheeb, Mooset, Rehooda, Eikidi and eight other villages and local communities scattered throughout the Hassai region, by building or giving access to educational facilities and medical care facilities, include childcare — a true rarity in the region — as well as hygienic water supplies, storage services and distribution facilities. Moreover AMC assists communities outside the Ariab mining area, including support for entry into universities, child welfare and community activities in collaboration with local and international NGOs. AMC is well placed to take full advantage of the administration’s sectorial policies on the extractive industries. As these policies are to boost production and productivity, and diversify production of mineral commodities while promoting investment in the country, AMC’s next steps will drive the whole country forward. 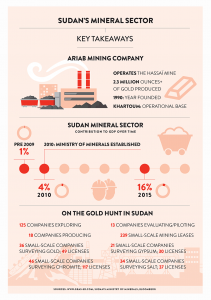 With the current global downward trend in oil prices looking set to stay with the world for many years, the prospect of untapped riches of gold in Sudan might be a truly bright spot for the extractive industries in the region.